Yesterday, my good friend Kareem met Stan Lee. Lee created Spider-Man, the Hulk, the X-Men, the Fantastic Four and so many other amazing comic book characters for Marvel Comics. Kareem and I have spent untold hours talking on the phone and in person about comic books and superhero movies that we wouldn’t even have today without the hard work of people like Stan the Man. Kareem and his dad were on their way to get haircuts at their barber in Beverly Hills and ended up going a little early when she told them she could work them in a little earlier than she’d previously thought. 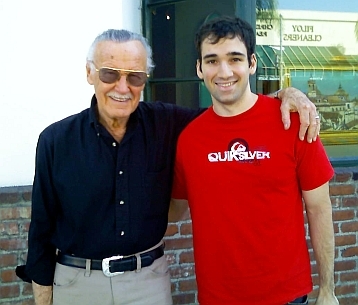 So Kareem and his dad are walking down the street on their way to their appointment and who does Kareem see but a man who looks a lot like Stan Lee strolling around by himself and window shopping. They talked for a bit and Kareem thanked Stan for all the wonderful characters he’s created and nurtured since writing an issue of Captain America in 1941. I’ve got the best kind of lump in my throat just thinking about it. Huge thanks to my friend Kareem for years of top-drawer discussion about the superhero movies and comics we grew up with and for sharing his photo and story, and thanks to Stan the Man for inspiring generations of guys like me with stories that will last forever. As for Kareem’s writing, you can check out his work alongside mine in the pages of Impact magazine. I’ve been writing for publications for nearly 15 years now. And even though Kareem’s several years younger than I am, he’s got a head on his shoulders and a way of expressing and articulating his passion for films that I’ll never have. And like I always tell him, when he hits it big I’m totally going to ask him for a job. Darjeeling Limited poster and TRAILER online NOW!